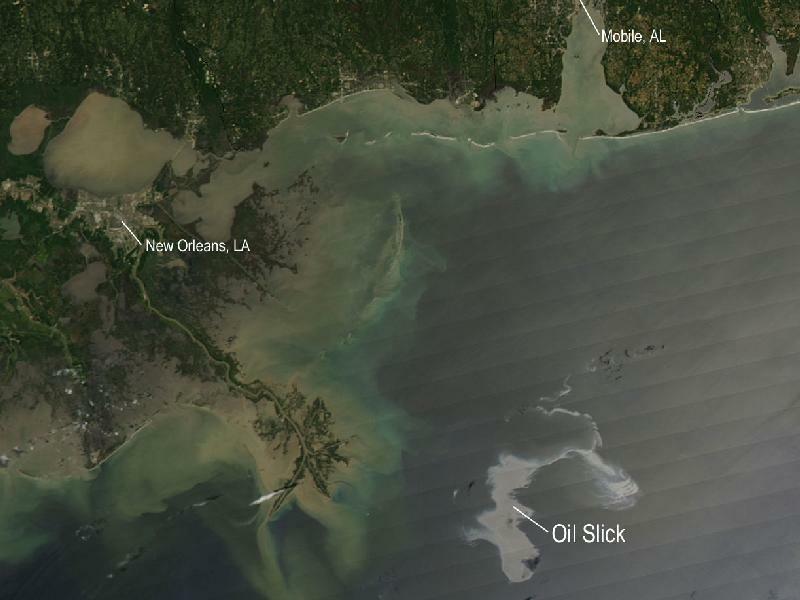 Images from the “slow-motion catastrophe” that began last week 50 miles off the coast of Louisiana brought to mind a bit of sarcasm I offered to a colleague almost exactly a year ago. The NRDC was running the below ad on Capitol Hill, saying, “Biofuels. If we’re going to use them, let’s do it right,” with a picture of the deforestation that many assumed would occur from use of biofuels. 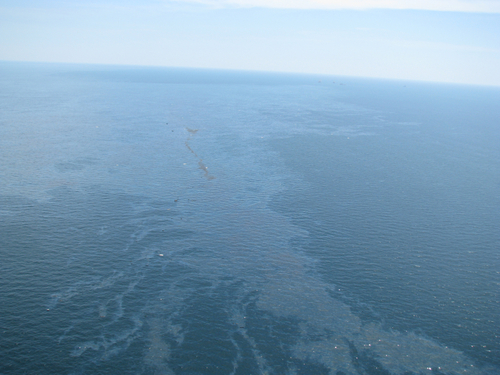 Now, of course, 5,000 barrels of oil each day are spilling into the Gulf of Mexico from the ruptured pipes of a deep sea oil well, creating an oil slick covering 400 square miles. While not yet rivaling the Exxon Valdez disaster, where 258,000 barrels leaked, the threat to wildlife and sensitive wetlands still exists. And consider, an estimated 90 rigs drilling in the Gulf of Mexico provide 1.7 million barrels of oil a day, nearly one-third of total US production. But of course, cellulosic and advanced biofuel production has fallen short of goals, primarily due to a lack of capital needed for rapid scale up. Investor confidence in the sector was undermined in 2008 and 2009 by a combination of the economic recession, wild volatility in feedstock costs, and predictions of impending doom by opponents of biofuels. Investor confidence may be slowly recovering, according to recent indications, but the overall mood still remains skeptical. A few of the more choice pronouncements indicate the general mood. “Very few investors in any cleantech sector are going to be investing the amounts of capital we saw at the height in 2008,” when venture capitalists were investing in production facilities, says Dallas Kachan, managing director of the Cleantech Group, a research and consulting firm that tracks venture-capital spending in green technology. On Wednesday, April 14 the House Ways and Means Committee will hold a hearing on Energy Tax Incentives Driving the Green Job Economy. The focus of the hearing is to examine the effectiveness of current energy tax policy and identify additional steps that the Committee can take to ensure continued job growth in this area while at the same time advancing national energy policy focus on a discussion of current and proposed energy tax incentives. Witnesses for this hearing have not been announced and we do not know how much of the hearing will focus on transportation fuels however, energy tax incentives for biofuels and biobased products should be a significant area of focus for this round of green jobs legislation. These technologies are ready to deploy and create near term job opportunities. Industrial biotechnology is the key enabling technology for producing biofuels and biobased products like bioplastics and renewable chemicals to aid in reducing our dependence on foreign sources of oil, thereby reducing greenhouse gas emissions. They also have the ability to crate jobs, jobs that are currently moving overseas due to their reliance on petroleum as a feedstock or more favorable economic or political environments. The United States has invested considerable amounts of taxpayer dollars to try to revive our economy. Too often, though, the resulting jobs are being created overseas, as other countries invest in green technology deployment. As a result, the opportunity to improve our economic competitiveness is lost. The United States is a leader in the research and development of green technologies, but to maintain that lead we must invest in the companies that are putting that green technology to work in our economy. These industries have shed hundreds of thousands of domestic jobs over the past two decades, as petroleum producing countries have attracted more capital investment. For example, U.S. chemical and plastics companies have increased capital investment outside the United States by 32 percent over the past decade, while increasing investment within U.S. borders by only 2 percent. The Renewable Fuel Standard (RFS) enacted as part of the Energy Independence and Security Act of 2007 sets the minimum level of renewable fuel that must be produced and blended into the US transportation fuel supply at 36 billion gallons by 2022. 21 billion gallons of that requirement must be cellulosic or advanced biofuels. Direct job creation from the advanced and cellulosic biofuels volumes in the RFS could reach 29,000 by 2010, rising to 190,000 by 2022. Total job creation could reach 123,000 in 2010 and 807,000 by 2022. Jobs will be across many sectors of the economy. Some projected job creation sectors are: labor/freight, mixing and blending machine operators, shopping/receiving/traffic clerks, truck drivers, chemical equipment/technicians, chemical plant/system operators/electrical, sales etc. The Ways and Means Committee can aid in accelerating this job creation by incentivizing biorefinery construction here in the United States. In 2008 Congress enacted a cellulosic biofuels production tax credit and enhanced depreciation for advanced biofuels facilities as part of the 2008 Farm Bill, both of which are scheduled to expire on December 31, 2012. Due to an overall downturn in the worldwide economy, this tax credit has not yet been utilized by cellulosic biofuels producers. This credit needs to be extended now in order to signal to investors that a plant being constructed this year, will have certainty in the availability of that tax credit once the plant begins to produce the advanced biofuel. A tax credit that expires before or shortly after production begins, does not create economic security for a yet to be built advanced biofuel biorefinery looking for funding. Furthermore, capital costs for construction of next generation biorefineries, which utilize renewable biomass to produce next generation biofuels and biobased products, are a substantial barrier to commercialization. Congress should provide an investment tax credit to help accelerate construction of next generation biorefineries and speed deployment of next generation fuels, chemicals and products. Historically, the U.S. chemicals and plastics industry was the envy of the world. At its peak in the 1950s, the industry was responsible for over 5 million domestic jobs and a $20 billion positive trade balance for the United States. Jobs associated with the industry were typically among the highest paid in U.S. manufacturing. However, the petro-chemicals and plastics industries are now hemorrhaging jobs overseas. Conversely, biobased products and chemicals production, like domestically produced biofuels, will stay in the U.S., in close proximity to their biomass feedstocks. Total US employment in the chemicals industry declined by over 20% in the last two decades and is projected to decrease further. The US is a world leader in industrial biotechnology with a wide range of companies pioneering new, renewable pathways to traditional petroleum-based chemicals and plastics. The potential job creation from bio-products is immense. Consider that the nascent biobased products industry employed over 5,700 Americans at 159 facilities in 2007 and every new job in the chemical industry creates 5.5 additional jobs elsewhere in the economy. Currently the biobased products portion represents only about 4 percent of all sales for the industry. Congress should create targeted production tax credits that can help them to expand their share of the market and grow additional domestic jobs. With an industry with the potential to grow by over 50% per year, bio-products can form the basis for a strong employment growth engine for the US. Clearly commercializing the advanced biofuels and biobased products industries is an integral solution to creating high caliber domestic green jobs in the United States that will catapult this country to be a leader in successful high tech, sustainable technologies. BIO will be urging the Ways and Means Committee through written comments to recognize that innovations such as these are some of the most promising sources of green jobs and economic growth for the future.